After taking a three-stroke lead with three holes left to play, Johnson appeared to be home-free, but the inaugural tournament ended in a wild finish. It was on a golf cart ride heading back to the 18th tee box to start a playoff when Julia Johnson first felt it. Moments earlier, she was a nervous wreck, but suddenly, a feeling of calm came over the freshman from St. Gabriel, Louisiana. 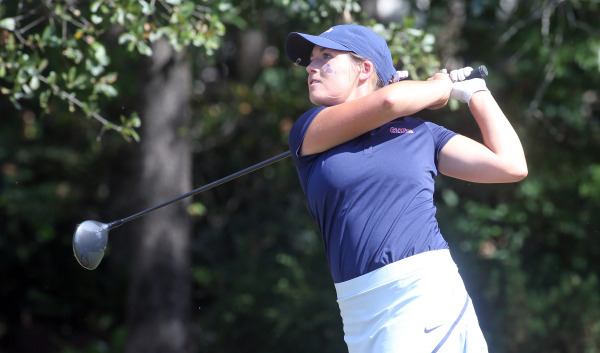 One hour earlier, the Ole Miss Rebel drained a birdie putt on the 15th hole to take a three-stroke lead with three holes left to play in the inaugural Magnolia Invitational. It looked like Johnson was home free, ready to wrap up a two-championship sweep for her team at its co-hosted tournament. But paired with her closest competitor–Memphis sophomore Abby Herrmann–Johnson was in for a wild finish. On the 16th green, Herrmann sank a tough birdie putt to make it just a two-stroke lead with two to go. Then, the nerves came. The final two holes at Old Waverly Golf Club are picturesque as they are perilous, wrapping around Lake Waverly into the shadow of the clubhouse. The 17th is a 170-yard par-3 with a small green that juts out into the lake, which lines the left side of the hole. Johnson landed her tee shot on the beach, leading to a double-bogey. Lead: gone. Johnson approached the 18th tee box still kicking herself over her only double-bogey of the entire tournament. With just her ninth over-par hole of the tournament still in the back of her mind, Johnson’s tee shot took a hard left and splashed into Lake Waverly. But seconds later, the Memphis Tiger who recorded only seven bogeys all tournament found the very same water. As if cleansed by trips to the water hazard, the two calmly took their drops and hit their third strokes to within five feet of one another at the back of the green. There, they faced one of the toughest putts on the course–a sharp drop off of the shelf that cuts down the middle of the 18th green. Johnson and Herrmann both rose to the challenge, dropping it within a five feet of the cup before confidently finishing with matching bogeys. Then came the hard part–waiting for what felt like an eternity for the field to finish and the playoff to begin. Fortunately, Johnson had everything she needed to make it through. Exactly one year prior to the Rebels’ trip to Old Waverly for the Magnolia, Johnson was on her official visit to Ole Miss. Johnson, Conner Beth Ball and Macy Holliday toured the Rebel facilities together as recruits, envisioning their future and the future of Rebel Golf. The three eventually signed and officially became Rebels. They’ve been on campus less than three months, but those three months have brought countless intensive practices, not to mention early morning kickboxing and weightlifting sessions. It’s been tough work, but already the Rebels are seeing the fruits of their labors. The hard work led to Johnson being in contention for the first individual title by a freshman in a 54-hole event in school history. But when she got there, she needed some assistance. About six holes through the second round, Johnson used a lifeline and called up a professional caddie: her head coach, Kory Henkes. Henkes has caddied professionally on the LPGA Tour for her college teammate at South Carolina, Kristy McPherson, and on the Web.com Tour for her brother, Kyle Thompson. And she’s now walked the course with two individual champions at the collegiate level. Henkes helped Johnson fight her way into the tournament lead, but after pulling back-to-back tee shots to the left, and looking at another trip up the water-lined 18th hole, Johnson wasn’t feeling so confident. Everyone let the freshman have some alone time in the tense moments between the end of her round and the beginning of the playoff. Assistant coach Drew Belt found Johnson sitting next to her golf cart, waiting for the signal to head back to the 18th tee. He didn’t give a famous rousing Coach Drew Speech. That wouldn’t work with this freshman–she needed some strategy. Belt explained mechanically why Johnson’s tee shots were going left, which helped clear the young golfer’s head. After the talk with Belt, and with Henkes still at her side, Johnson headed back down the cart path to the 18th tee for the first playoff hole. At that moment, Johnson knew that she would win the Magnolia. Johnson and Herrmann played to gutsy pars in the first playoff hole and headed back down the cart path again–and before long, Johnson’s feelings became reality. The Louisianan planted her second shot safely on the green, while Herrmann left hers in the rough short and to the left of the putting surface. 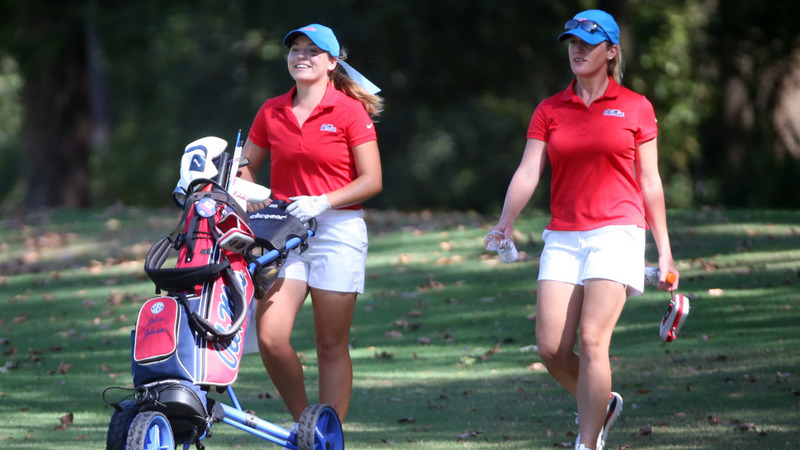 The Memphis sophomore struggled to make it out of the rough, and with a win just two putts away, the Rebel stepped onto the green with a familiar pep in her step, ponytail bobbing, and no nervousness in sight. Johnson closed the door with a definitive par putt to secure the 21st individual title in program history and its eighth sweep of both the individual and team honors. It was a crazy ride to arrive at that conclusion, but with a foundation laid, Johnson was up for the challenge.